The Lagos state police command has confirmed the death of a man belonging to a notorious criminal gang terrorizing the state on Wednesday, September 19th. 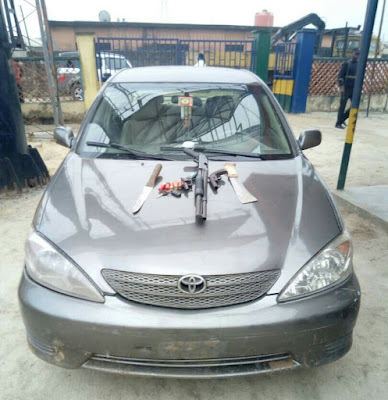 A statement from the state police command's spokesperson, SP Chike Oti, says a tip off from a well meaning citizen to the Divisional Police Officer in charge of Owode Onirin, Ikorodu Lagos, changed the game for the criminal gang who had at about 6pm yesterday, at Demuren street, Alapere, stabbed one Sylvester Chikwendu, male, aged 32 years, suspected to be a rival cult member to death. Sequel to the information, the DPO, mobilised a crack team to Thomas Bus-stop, Owode. He told his men to narrow the road and gave them a clear description of the gang's operational car. When the gang approached the police zone, they became desperate and opened fire on the operatives in their last ditched effort to evade arrest, eliciting immediate response from the team. However, in the ensuing gun battle, one of them bowed to death owing to bullet wounds sustained during the fight while the others escaped with varying degrees of gun shot wounds. The fleeing criminals abandoned the following items which had since been recovered, at the scene; viz: their operational vehicle, a Toyota Camry saloon car without registration plate, one pump action rifle, one locally made revolver pistol, one locally made single barrel pistol, five live 9mm calibre ammunition, three live cartridges, two expended cartridges, two cutlasses, charms (Juju) and assorted clothing. The Commissioner of Police Lagos State, CP Edgal Imohimi says that the quick resolution of a crime that started at Alapere, should signal criminal elements that the security in place in the state is virtually impregnable. He added that now that the ember month has come, police personnel serving in the state are under firm instruction to decisively subdue perpetrators of violent crimes. The CP appeals to health care professionals including native doctors and other care givers, to be on the lookout for patients with gunshot wounds and inform the police within two hours of commencement of treatment in line with the Compulsory Treatment of Victims Of Gunshot Act.